The pyramid of Khufu is the largest, oldest and only true surviving member of the Seven Wonders of the Ancient World. It was built in Egypt in the 26th century BC. This Seven Wonder held the world's tallest man-made structure title for over 4400 years until 1889 when the Eiffel Tower was built. The base area of Khufu's pyramid is equal in size to that of six big-city blocks. Most of the chiseled stones used to build this Seven Wonder are as big as small pickup trucks. The rugged exterior we see today on Pharaoh Khufu's tomb was originally covered by a beautiful smooth limestone surfacing. That valuable material was subsequently filched by later rulers for use on their own buildings. 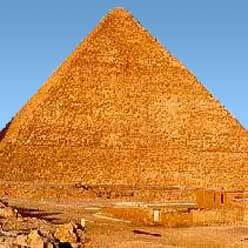 This lowered the height of the pyramid by about 5% to its current height of 138 meters (456 feet). It also shortened its base width. It was once legal to climb Khufu's pyramid (as I and many other travelers did years ago). Today, the government prohibits climbing out of concern for visitor safety and possible vandalism.